Choosing the most appropriate furnishings for your home can be fun – and challenging. Homes are made to be lived in and things used, not just looked at. Choosing the best, and most practical items with which to furnish your home can be difficult if you are not really sure that they are made with quality fabrics that will stand up over the long haul. Having a good understanding of fabric types and knowing how to best care for them definitely helps. Rugs and accent pieces are often bought with little or no consideration about the care and long term appearance of the piece. Things such as accent rugs are often misused, and rather well used instead of lightly used. Since they are mainly chosen as part of a designed look and to be used as contrasting accents for colour. Some pieces are not really meant to be used and can show signs of wear and damage early, and can become virtually uncleanable. There are really 2 main types of rugs: High quality rugs and those that are made to look like, but aren't really high quality rugs. Rugs made from wool and silk are the most prized, while those made from synthetic fibres just mimic wool to varying degrees of success. Sometimes synthetic rugs are a better choice than wool rugs if the desire is to use the piece as as a barrier from direct outdoor soiling, such as an entry mat, rather than a higher priced wool rug. Any type of rug will not withstand heavy amounts of traffic and soiling, and therefore using one of lesser quality and price makes sense, as it can be disposed of when no longer useful. It's sad to say that this option exists at all, as everything should be built to last. Even professionals find that cleaning a rug of lesser quality of yields lessor results. 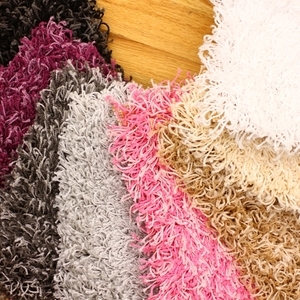 One type of popular choice of rug style these days is a long fibre shag rug, usually sold in very stark white or bright colour. Modern choices of rugs such as this type of rug, also referred to as a synthetic frieze, or California Shag, should be bought with care. These are not the same types of rugs that your parents had, for 2 main reasons. One, these type of shag's are a different shape of synthetic yarn which shows damage very quickly; Two, the fibres are very long making them difficult or almost impossible to vacuum and subsequently hold onto a lot of debris. Rugs of this variety should be occasionally taken outside and beaten, or overturned and vacuumed on the back side to vibrate out all of the things that can become lodged in the hard to reach areas. If you do decide that on one of these types for your home, try to avoid placing it in a well used area as the resulting damage from being well used turns the bright fibres slightly grey and dull.